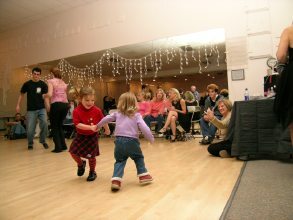 Evergreen Ballroom gift certificates are the perfect way to give the gift of dance! All instructors at the ballroom accept Evergreen Gift Certificates like cash for private and group instruction or dance parties. Certificates are $10 each. Click the 'Add to Cart' button below. You will go to a Pay Pal page where you can choose the quantity you want. You can pay with your PayPal account or register as a guest and use a credit card. Processing usually takes 48 hours, and shipping is by priority mail. In a hurry? Email our office manager to see if we can speed things up for you. Gift certificates come in a separate gift envelope with our current calendar and information about getting started at the ballroom. Thanks for dancing with us! !